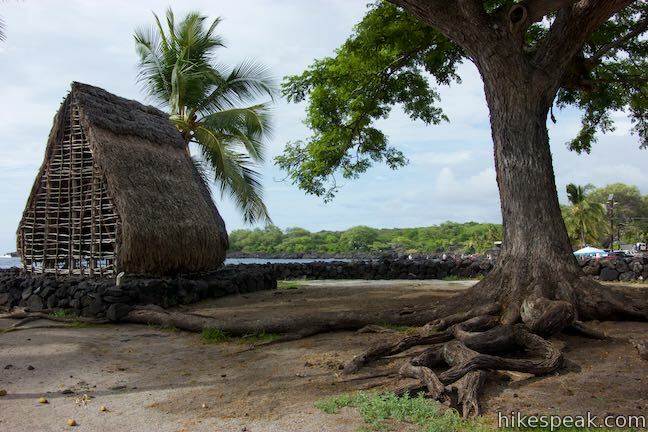 To walk through Hawaiian history, head to Pu‘uhonua O Hōnaunau National Historical Park, located on the west coast of the Big Island of Hawai‘i, south of Kona. 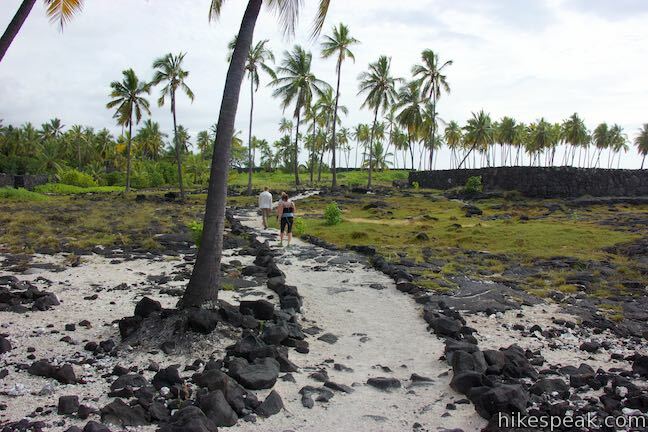 A convenient hiking trail weaves through the park’s Royal Grounds and the Pu‘uhonua (place of refuge). 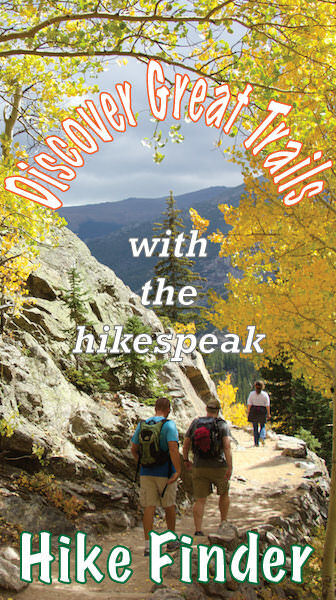 This half-mile long loop passes sixteen numbered markers that correspond with entries in a park brochure to put an educational spin to the scenic surroundings. Set out from the visitor center and walk down toward the coast. 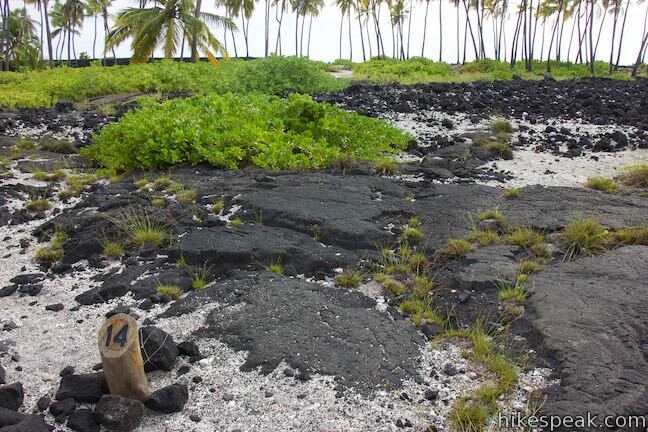 Leave the concrete and step onto a pale, crushed rock surface at a three-way junction. One end of the loop is to the left. Another path goes straight. Ignore both and bear right to begin the counter clockwise loop. The first marker announces that you are on the royal grounds. 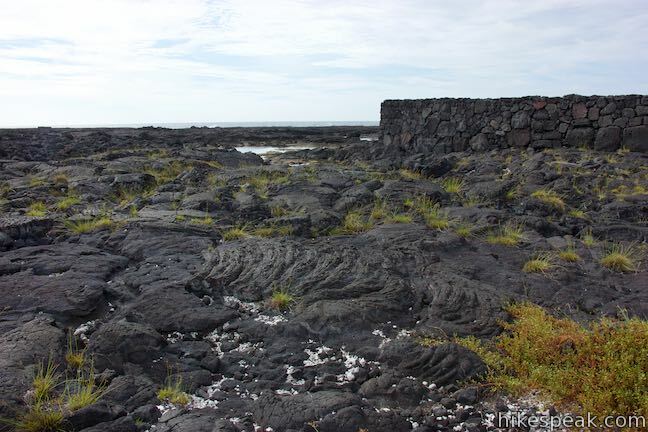 Be respectful of this sacred site, which was used by ali‘i (Hawaiian chiefs) as a place to host important gathering and ceremonies. 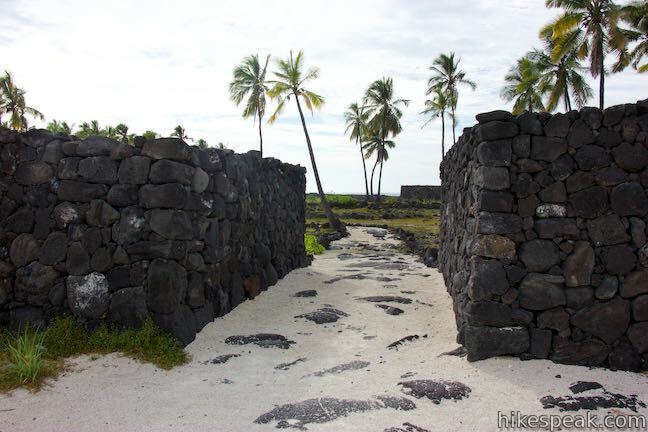 Hōnaunau was the home of Kona’s chiefs and the ancestral grounds of the Kamehameha dynasty. Walk toward the coast, passing a scaled-down model of the Hale o Keawe temple on the right. You will see the actual temple midway through the loop, but won’t be able to step inside. 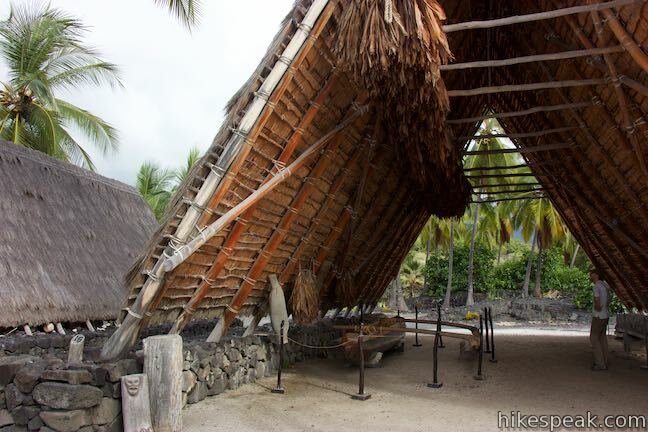 The recreation is still plenty large, with a thatched roof made of ki leaves. Straight ahead, find another smaller structure next to the coast. Looking north, people may be visible swimming in a cove just beyond the park boundary. 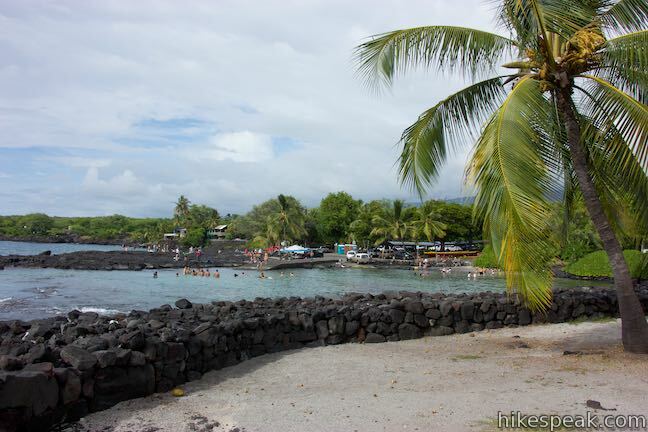 Swimming and snorkeling are not allowed within the royal grounds or pu‘uhonua, but the boat launch and snorkeling area along Honaunau Beach Road just outside the park appear to be quite popular. Curve to the left and approach the next few markers. 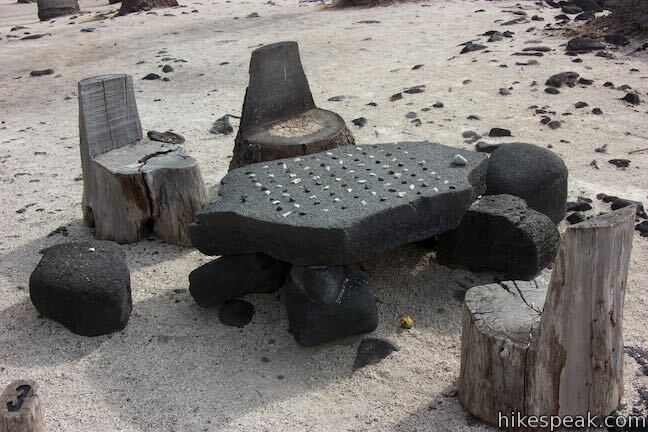 Marker 3 is placed beside a lava rock game board with black and white pieces. 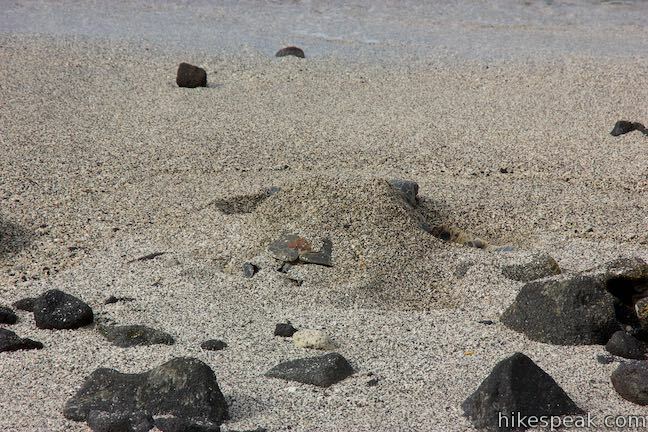 This Hawaiian strategy game is called kōnane. 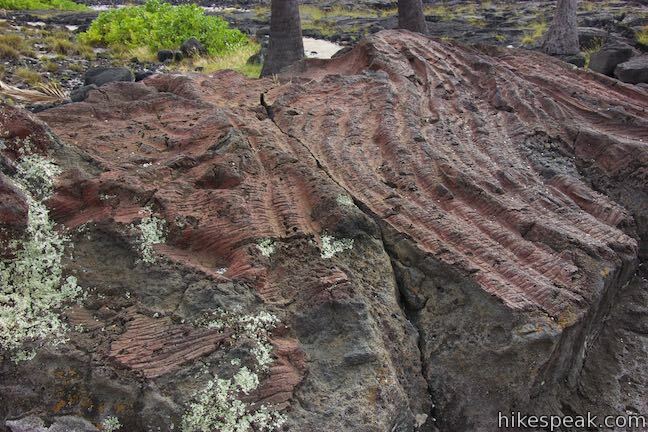 The playing surface, called the papamū, can vary in size. Instructions for kōnane should be available at the visitor center. 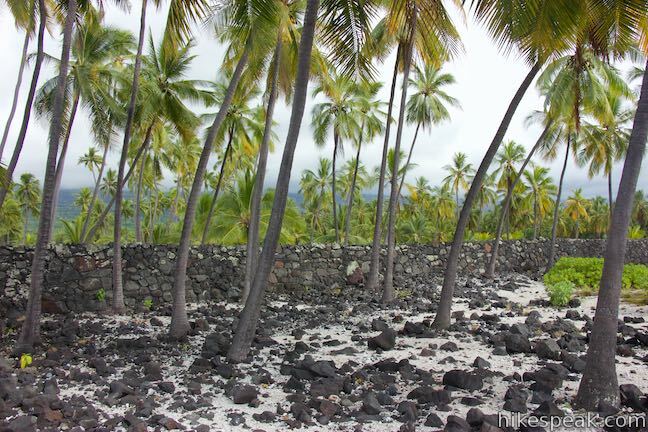 When hot lava surrounds a living tree, moisture in the tree causes the lava to harden before it burns. Sometimes this leaves tree molds like you see here. 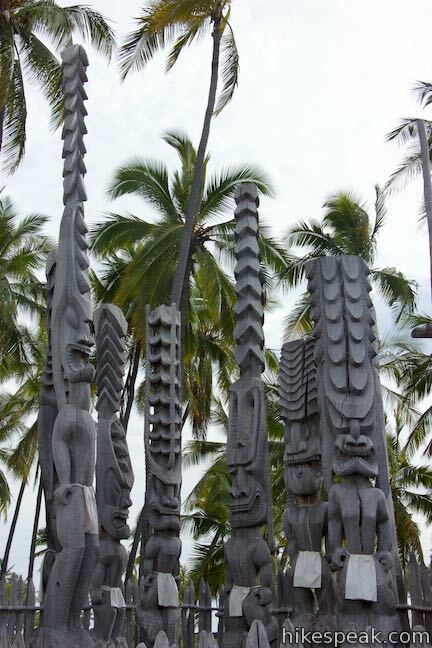 Many molds in the park are of loulu palms. 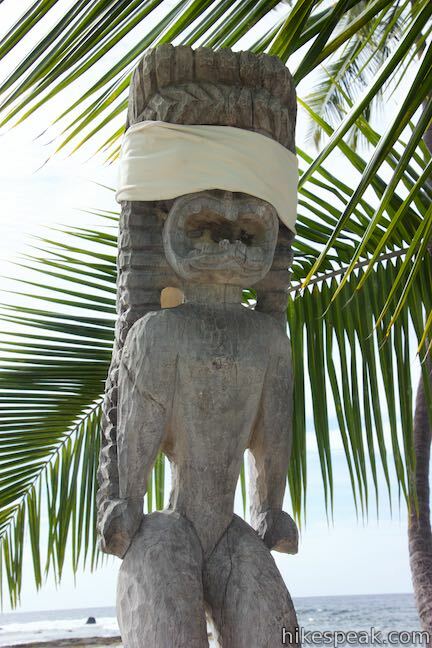 Loulu were once abundant, but now are endangered. 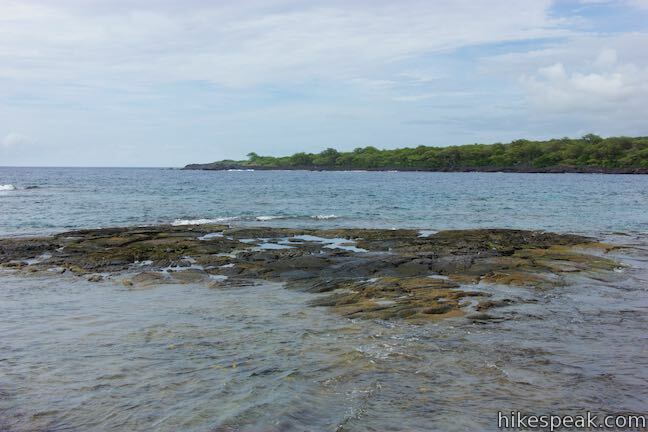 The trail swings around Keone‘ele Cove (marker 6). This significant cove was reserved for the canoes of chieftains. 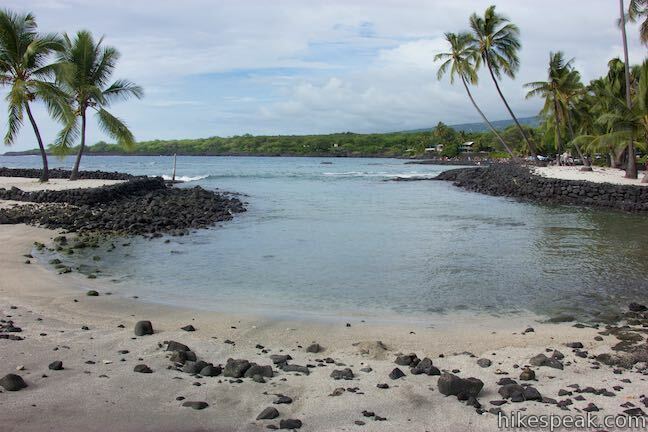 The brochure asks you to picture paddlers maneuvering canoes around lava rocks in the bay to bring the ali‘i, priests, and advisors ashore in the cove. 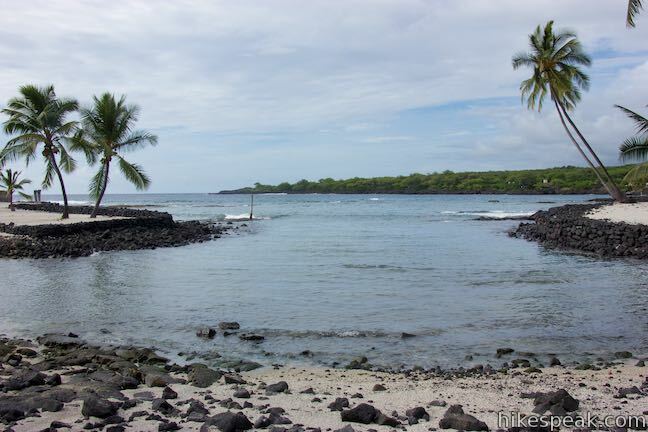 This VIP area is now reserved for the sea turtles (honu), who drift through the water and hide in the sand along the shore. 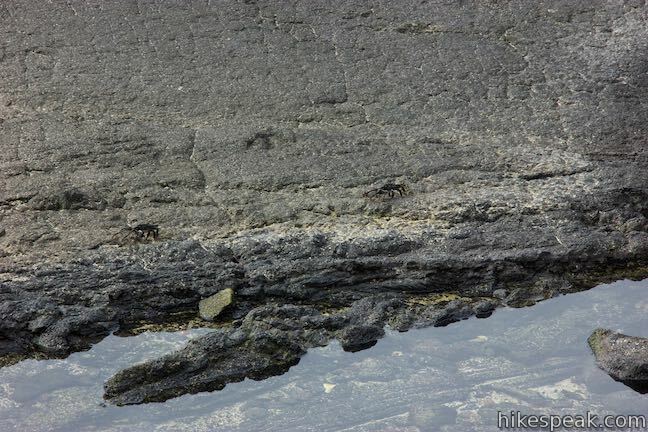 Admire the sea turtles from a respectable distance. 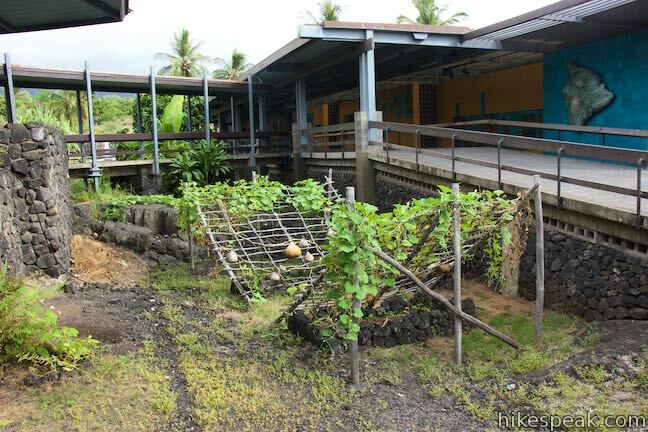 Behind the cove is a fishpond, which you’ll pass later in the loop. 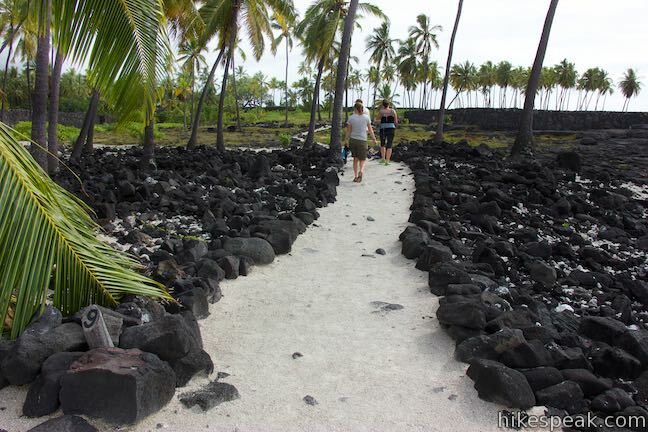 For now, continue around the cove through a cluster of coconut palms and approach a long black wall made up of lava rocks. 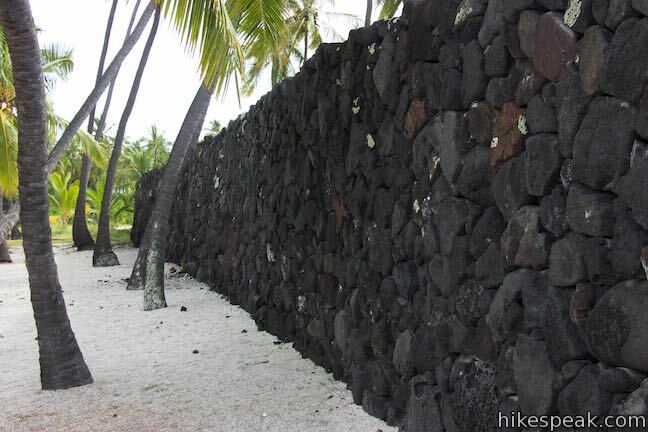 Up to 12 feet tall, 18 feet wide, and over 950 feet long, this wall defines the sacred space of the Pu‘uhonua. 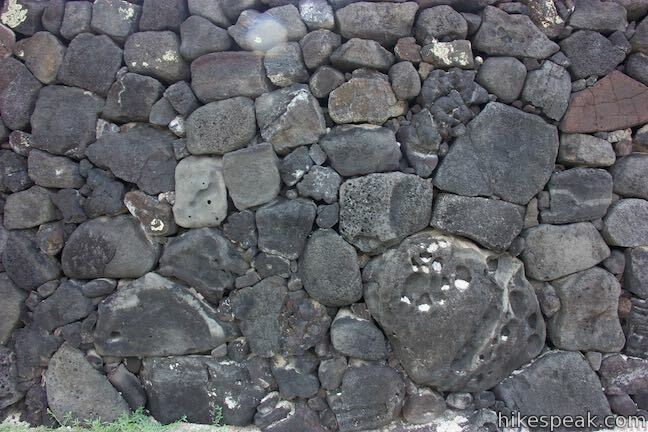 The wall was constructed over 400 years ago using uhua humu pohaku (dry-set masonry) – stones fitted without mortar. 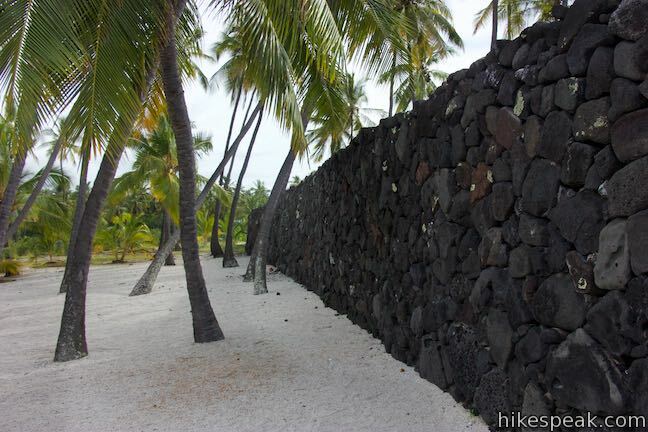 The dark wall stands out against the light-colored grounds. 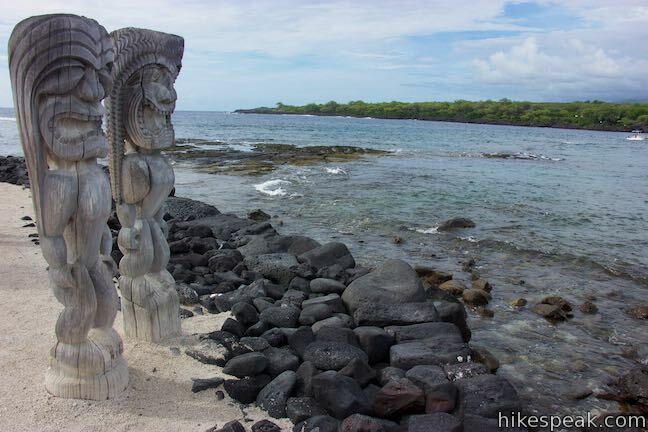 Walk to the end of the wall to the park’s main feature, the Hale o Keawe, which is fenced off and guarded by ornate wooden statues. 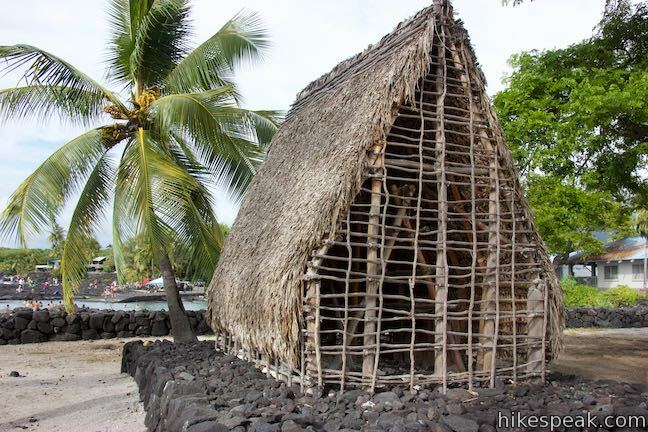 This heiau temple is a sacred place for the Hawaiians and is a mausoleum for the remains of 23 ali‘i (chiefs). 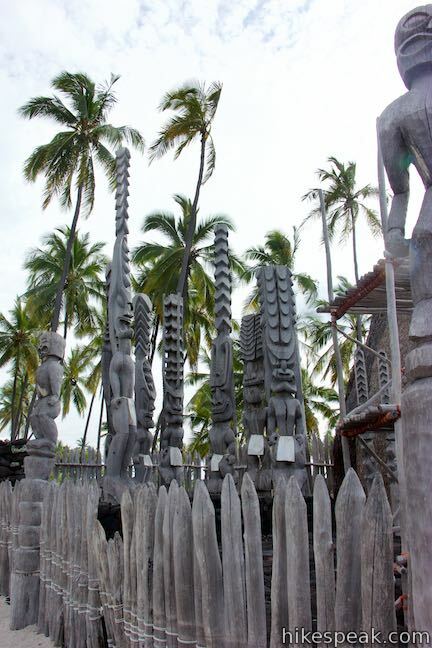 Tall statues carved in wood are called ki‘i. 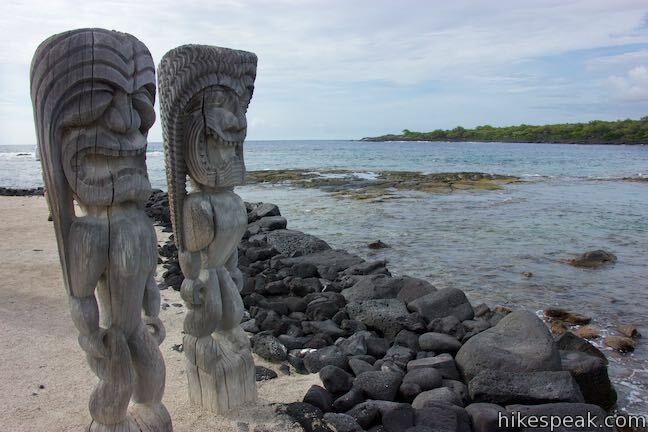 They represent Hawaiian gods and stand as indicators of the site’s significance. 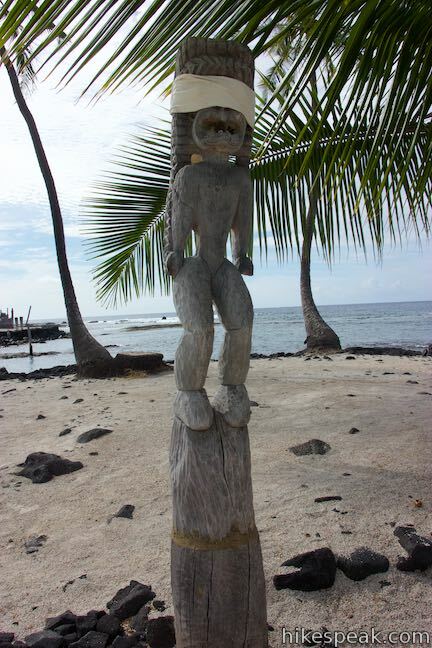 Walk right up to two of the ki‘i guardians that stand near the water’s edge. 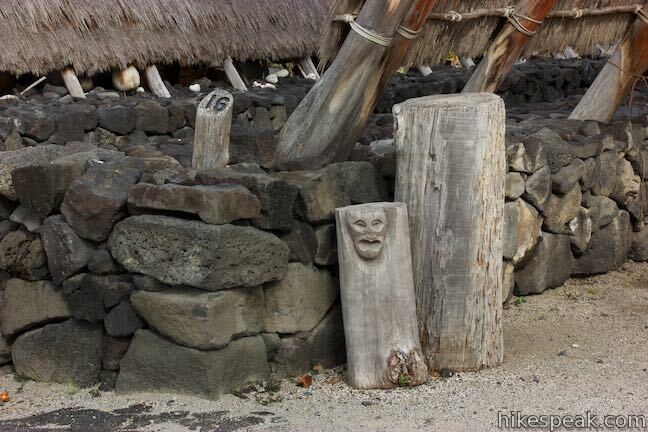 Now imagine the impression that these carvings would give off if you were arriving by canoe. 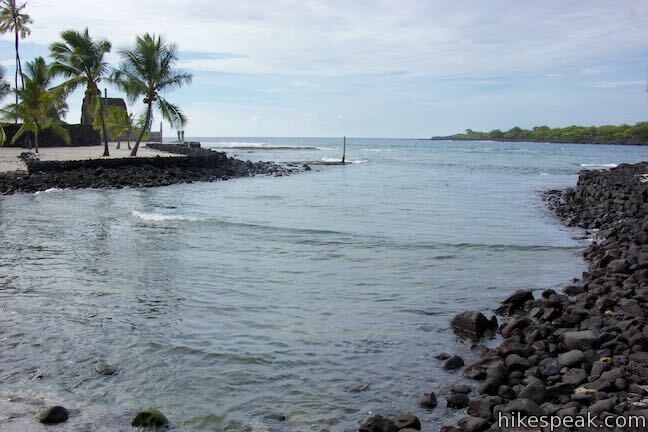 At this point, 0.2 miles from the start, you are leaving the royal grounds for the pu‘uhonua. 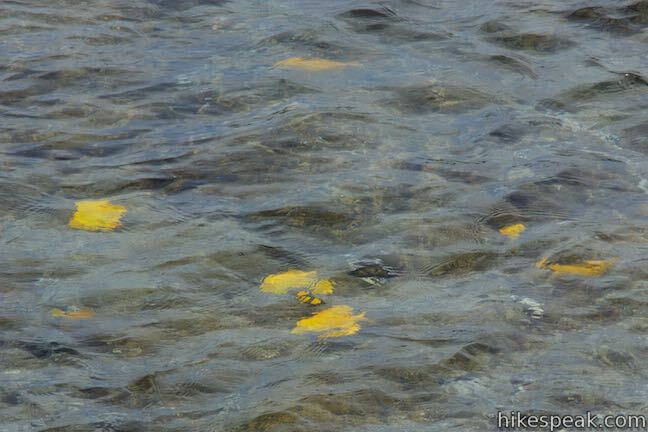 Walk around the temple, passing tide pools on the right where tropical fish like yellow tang swim in the shallows. 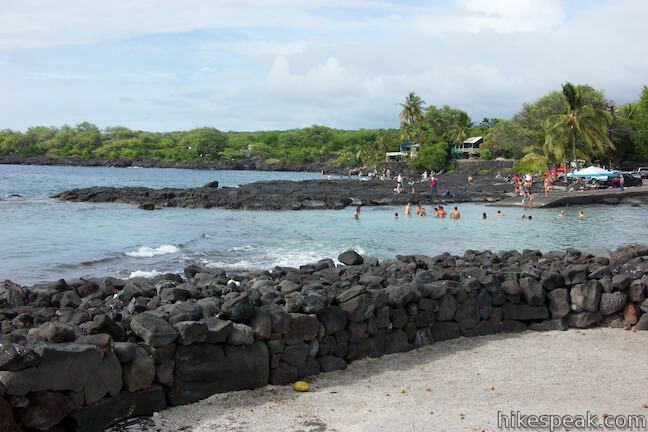 The only way to avoid punishment was to elude pursuers, run to the coast, and swim to a pu’uhonua. Those who pulled off this feat could be absolved by kahuna pule (priests). After a short time in the refuge, law-breakers that were pardoned by priests would be able to return home. 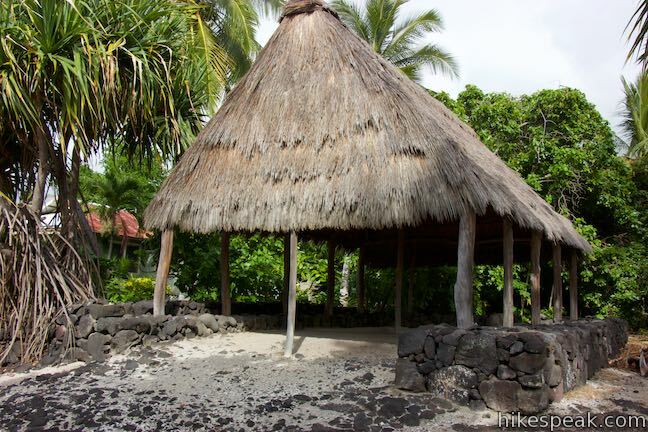 During wars, pu’uhonua around Hawaii served as outside-the-battle safe spaces for children, elders, and other non-fighters. 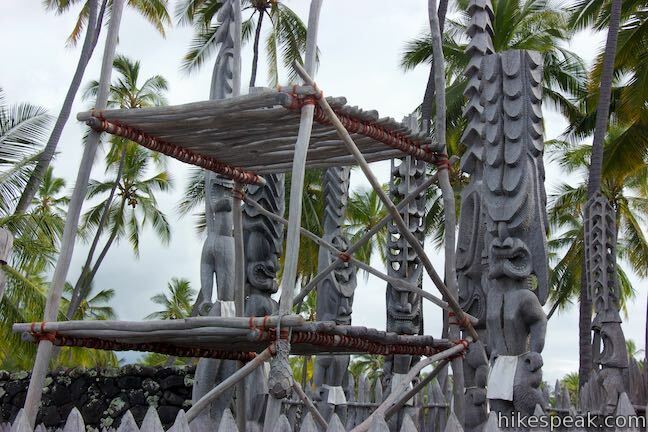 When wars ended, people from the losing side might seek the sanctuary of the pu’uhonua as well (instead of facing death). 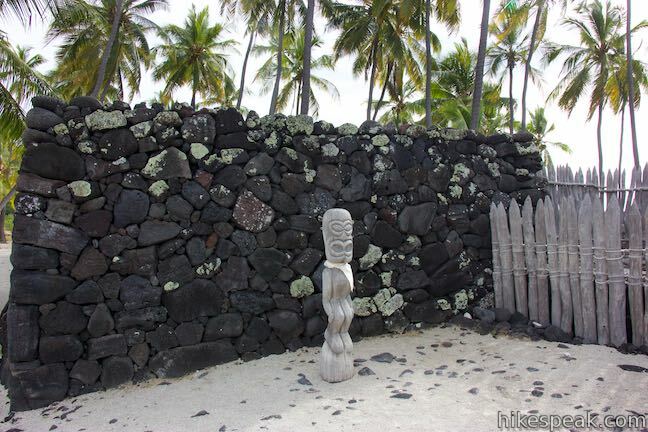 Within the walls of a pu’uhonua, no physical harm could come to you. 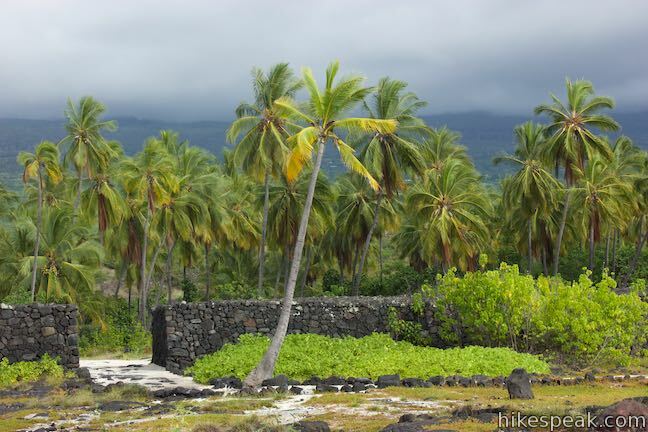 The Pu‘uhonua O Hōnaunau, like all pu‘uhonua in the islands, served Hawaiians for hundreds of years until kapu ended in 1819. 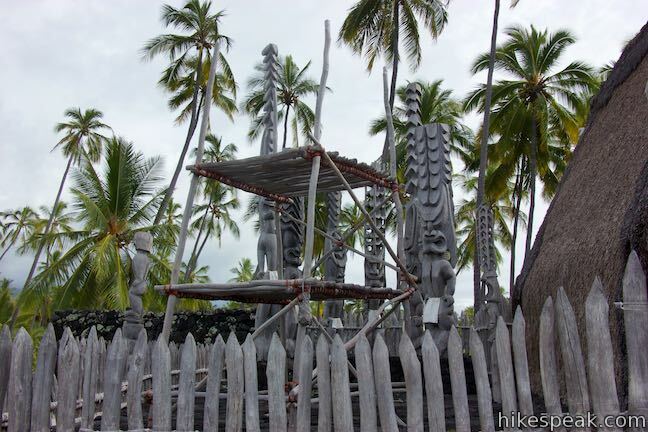 It remains a sacred place of peace, calm, and refuge to Hawaiians, open to all who find their way here. 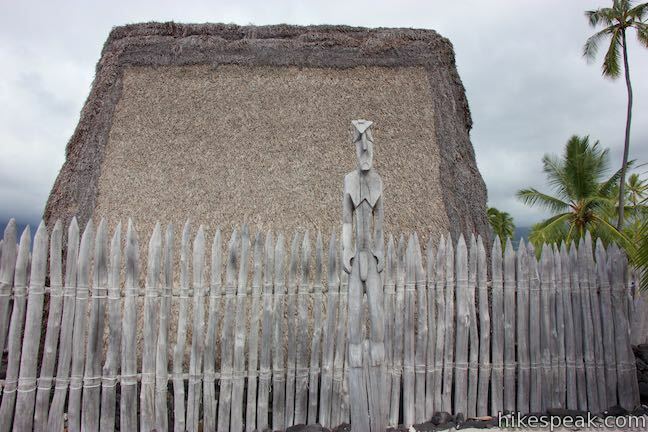 For centuries, the pu’uhonua provided threatened Hawaiians with a second chance at life, until the kapu laws were abolished in 1819 by King Kamehameha II, the second ruler of the unified kingdom of Hawaii. 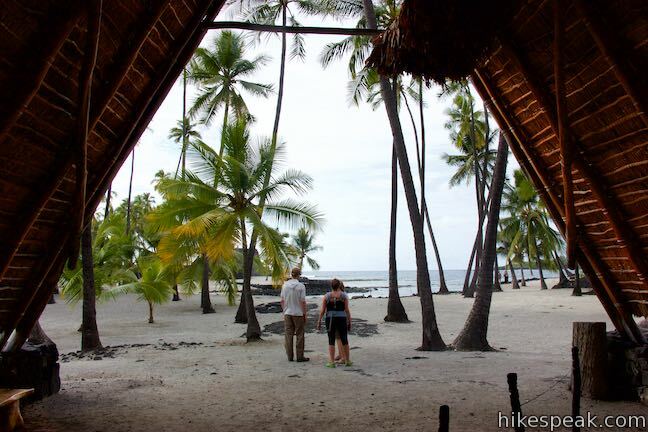 Today’s visitors no longer need to escape death sentences and be pardoned by priests in order to enjoy the calm refuge of the pu’uhonua. 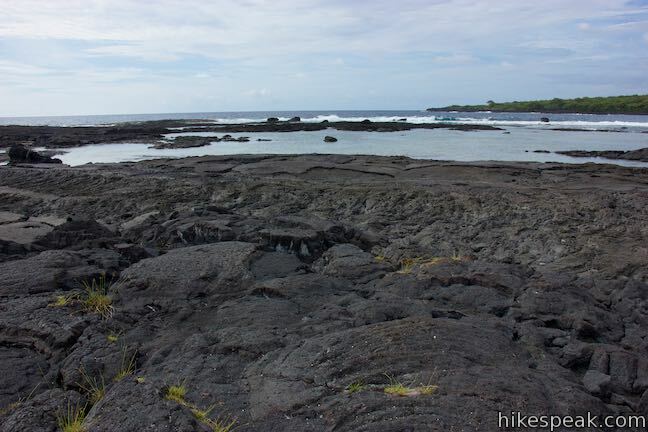 A rugged coastline of dark lava rock and tide pools spreads out to your right as you follow the pale trail southward into the pu’uhonua. 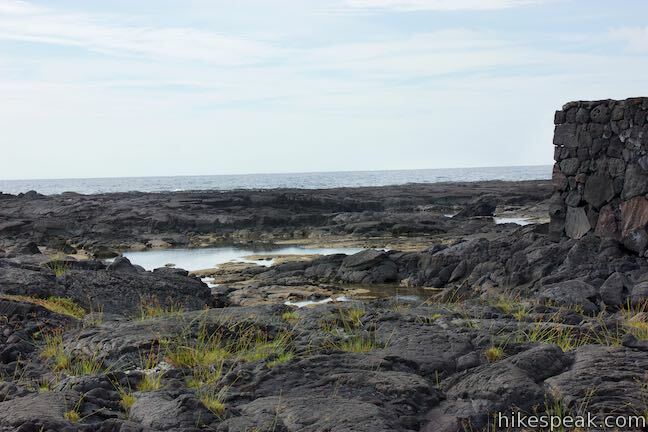 A hundred yards from the Hale o Keawe, come to a spur path on the right that leaves the loop trail. 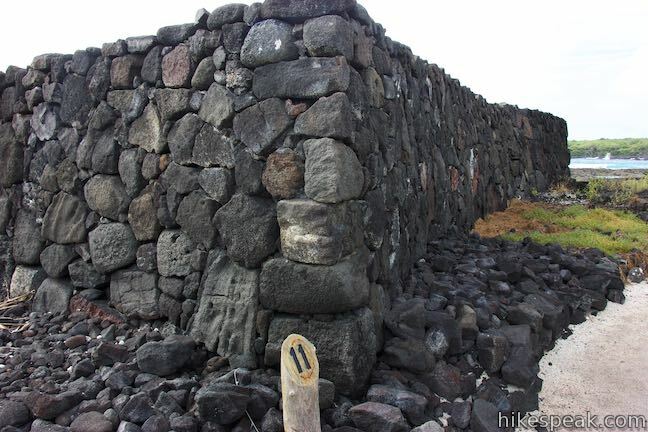 The path leads around the rock wall of a heiau, called the the ‘Āle‘ale‘a, which likely predates the Hale o Keawe, and was used by ali‘i as a platform for watching hula. 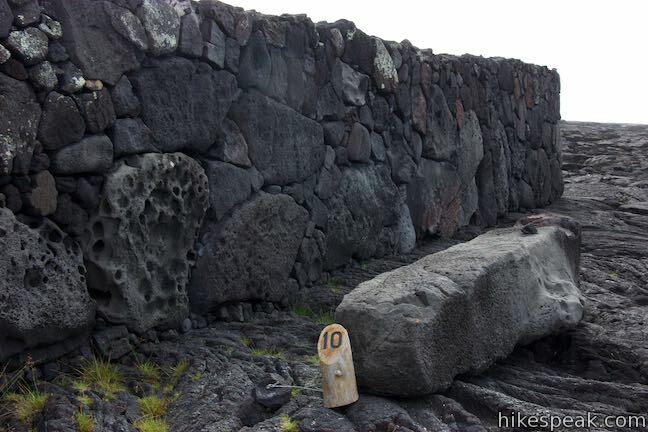 At the end of the spur path, spot marker 10 beside the Keōua Stone. 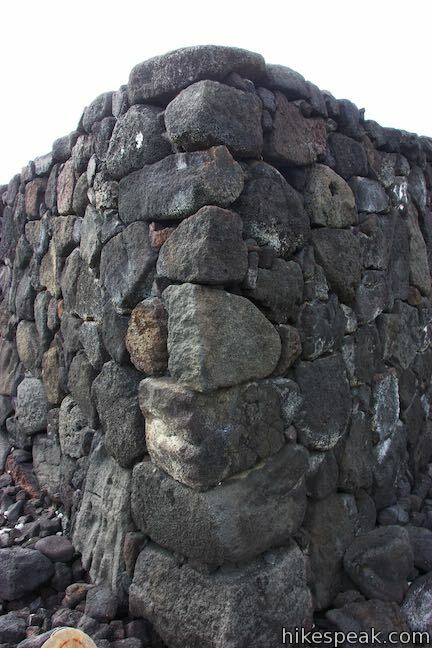 This block of volcanic rock was a resting place for a high chief. Notice four holes in the ground around the rock, which likely supported a shade canopy. 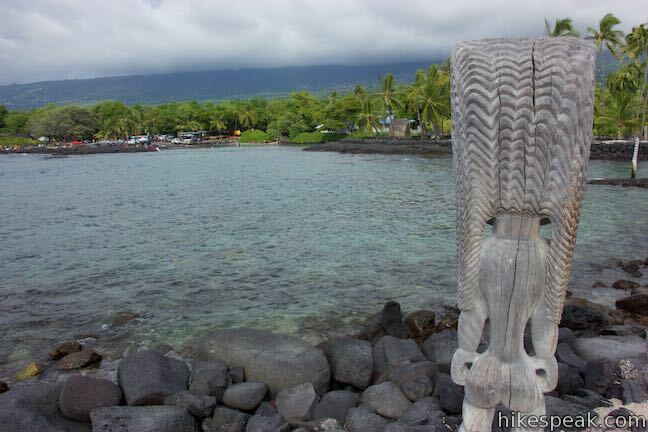 Imagine yourself as Keōua, gazing out over the blue bay and the black shoreline. 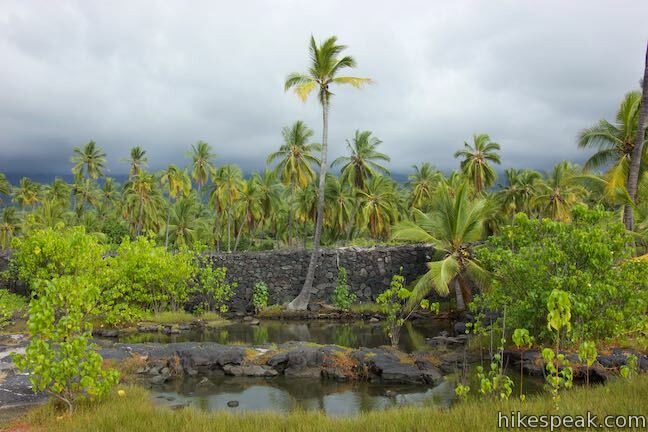 Backtrack to the junction and turn right to continue on the loop trail along the rock wall of the heiau. 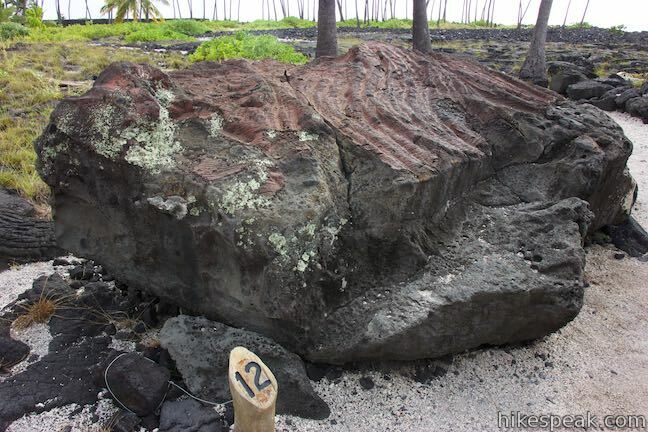 Approach a large boulder of dark red lava. 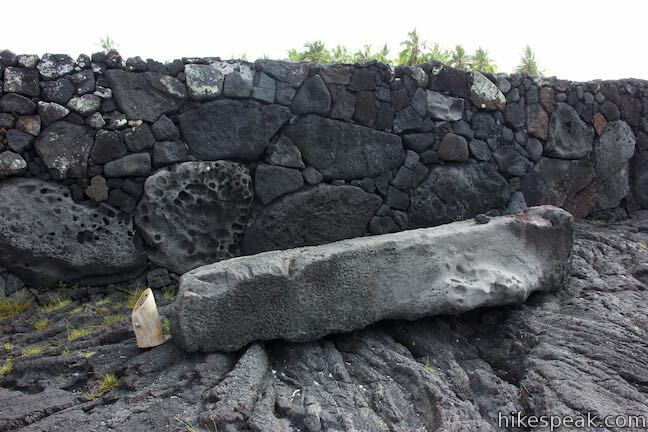 It is believed that Queen Ka‘ahumanu hid under this impressive stone during a quarrel with King Kamehameha. 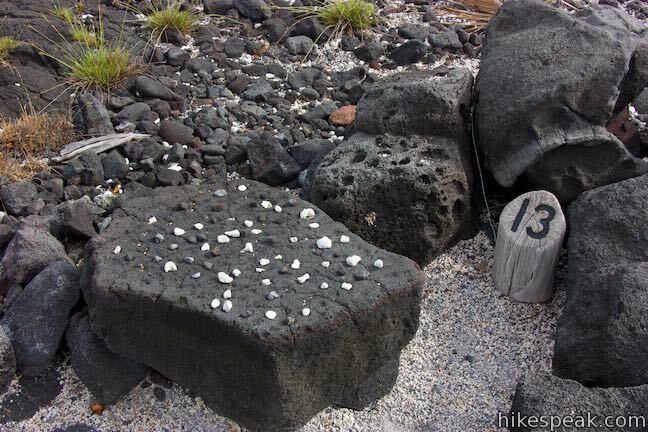 The trail passes marker 13, where another rock has a carved depression laid out in a papamū board for playing kōnane. 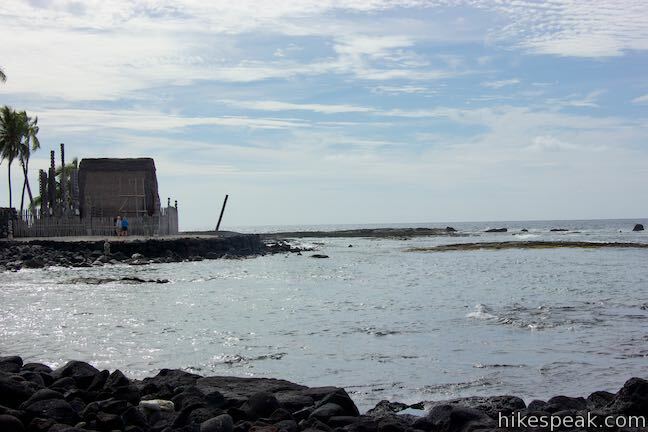 Enjoy coastal views on the way to the next marker, at the site of a temple build long ago. 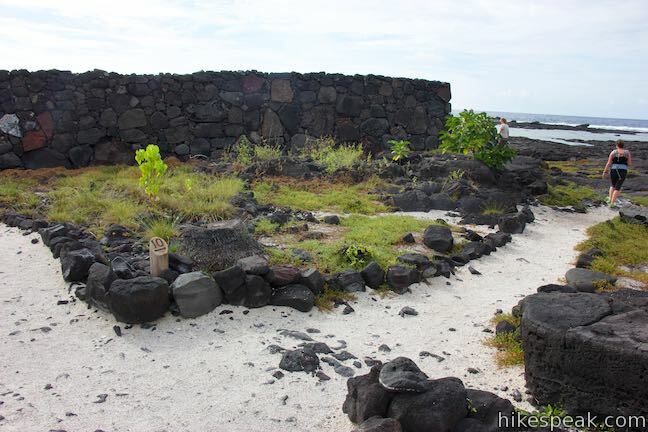 Although this old heiau is hard to see, the remnants are believed to be some of of the oldest structures in the park. 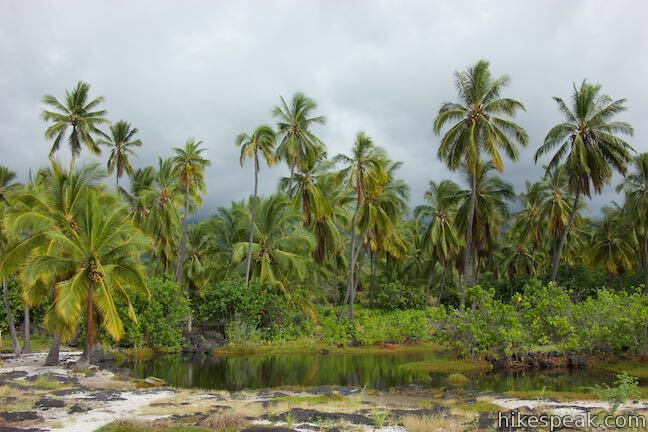 The trail now turns inland, weaving toward a forest of palms. Standing out from this natural scene is the black boundary of the great wall. Pass a small pond as you approach the wall. 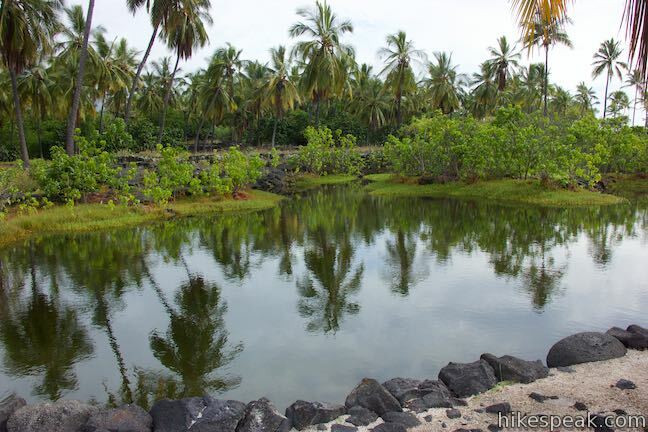 This type of pond is called an anchialine pool, because it is fed by both freshwater springs and ocean water. Continue along the trail toward a modern opening built through the wall, which allows easy passage back to the royal grounds. The loop trail passes two more numbered markers as it progresses back toward the visitor center. 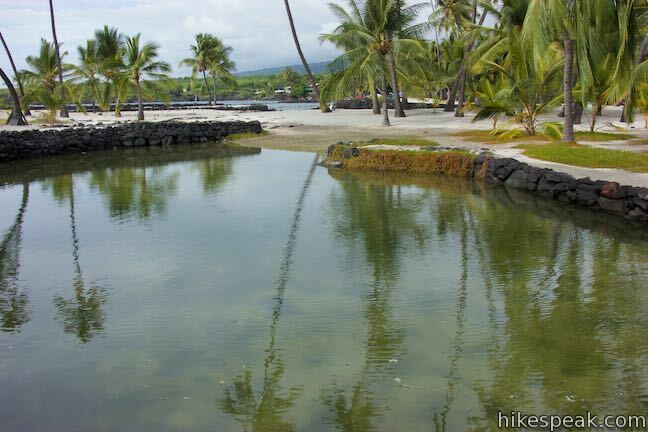 At marker 15, ease between two royal fishponds located behind Keone‘ele Cove. 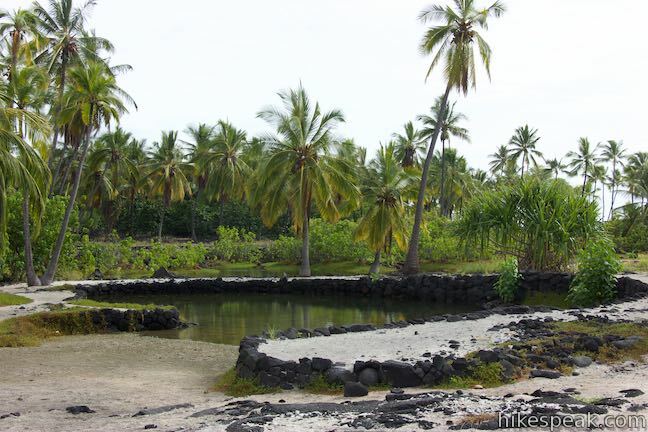 These anchialine pools were used for fish farming. 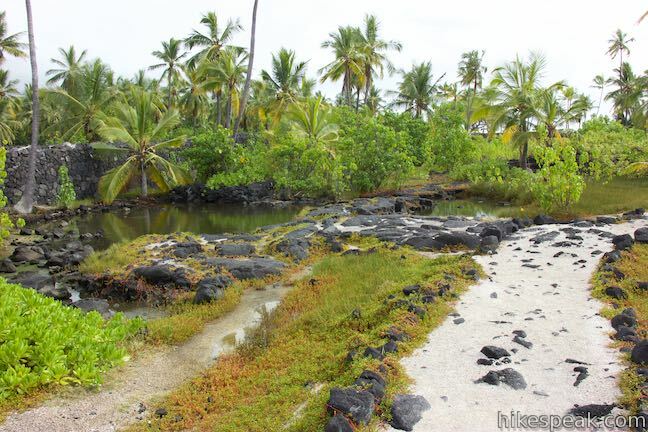 According to kapu, fish harvested from the ponds could only be eaten by the ali‘i. 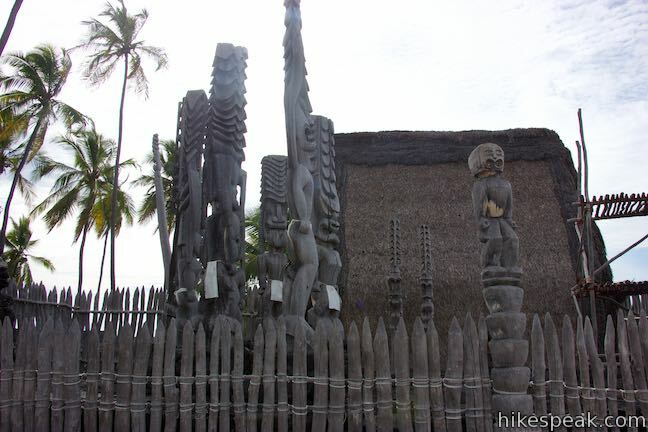 Just before the visitor center, pass a pair of tall wooden structures with thatched roofs. 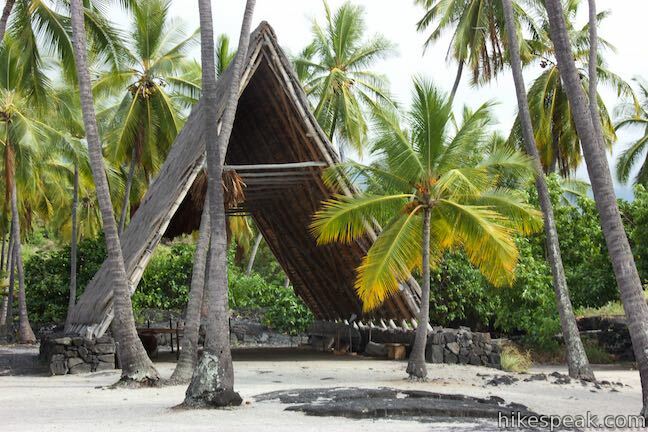 These hālua serve as boathouses for wa‘a, traditional Hawaiian canoes. 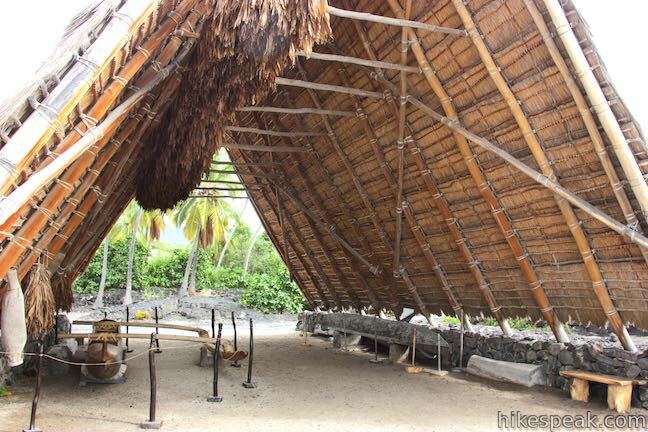 Step inside the hālua and you may find artisan Hawaiians getting crafty with natural materials like coconut husks. 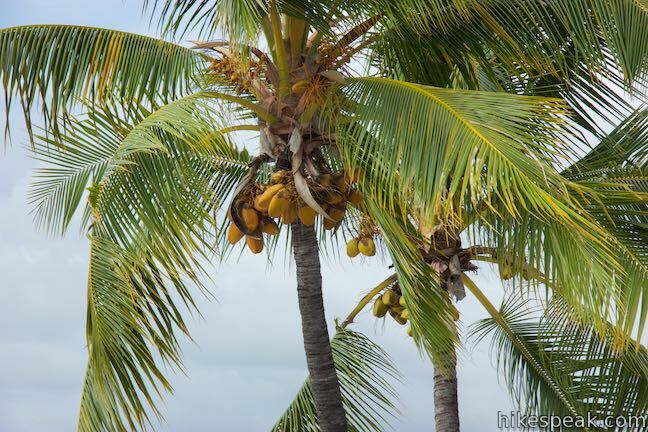 Leave the hālua and close out the loop. When you get back to the start, turn right and walk back through the visitor center to the parking area. 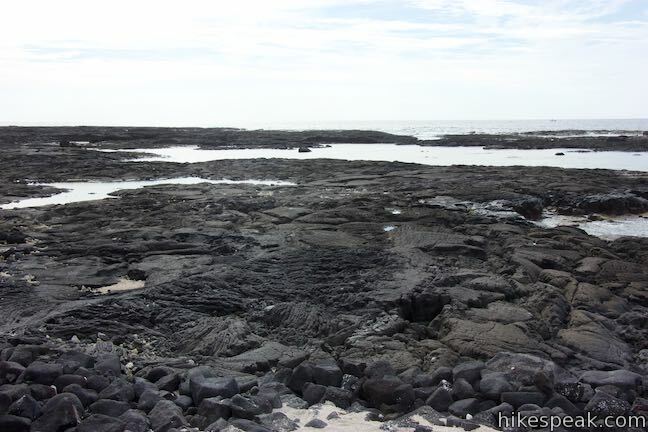 For additional hiking in the park, consider the 1871 Trail venturing south down the coast. 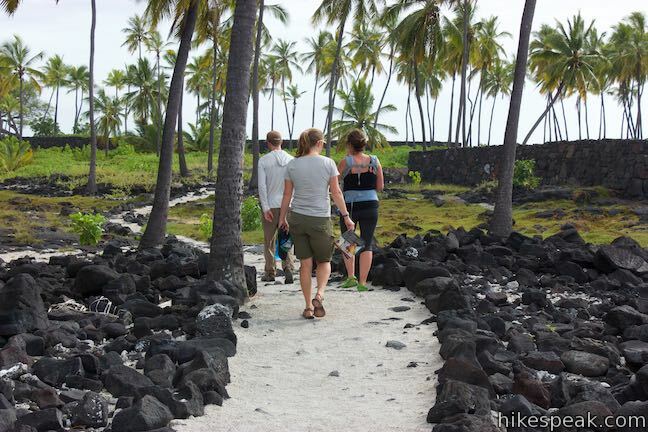 No permit is required to walk the Royal Grounds – Pu‘uhonua Loop. 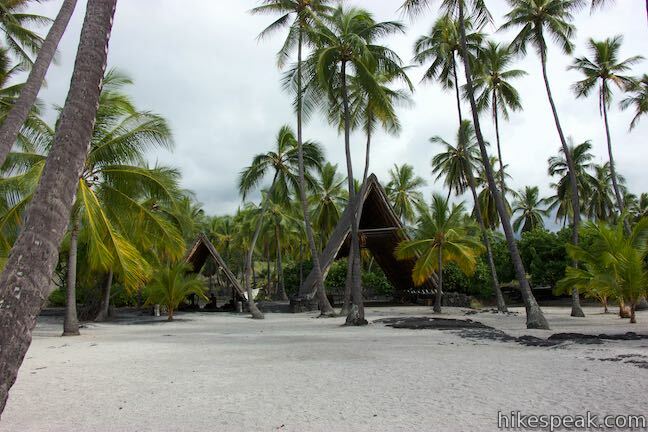 However, an entrance fee is charged to visit Pu‘uhonua O Hōnaunau National Historical Park (operated by the National Park Service). The fee is $15 per vehicle, or $10 or motorcycles and $7 for pediatricians and cyclists, and is valid for seven days of entry (prices as of 2019). 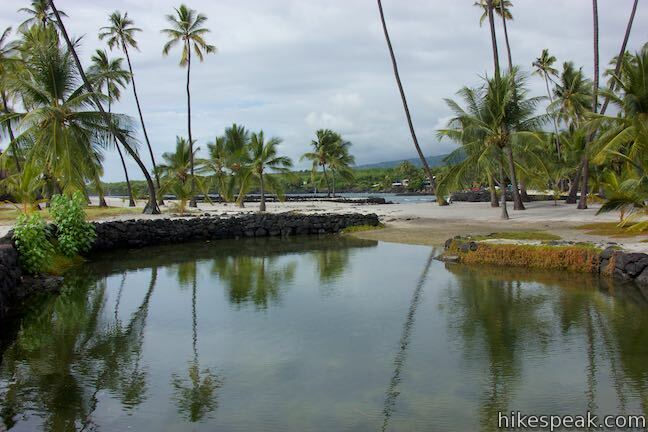 In lieu of individual park entry fee, an America the Beautiful interagency pass may be used, as well as an annual pass eligible for three Hawaiian national parks (Hawai‘i Volcanoes National Park, Haleakalā National Park, and Pu‘uhonua O Hōnaunau National Historical Park). The park opens daily at 7 a.m. and closes 15 minutes after sunset. 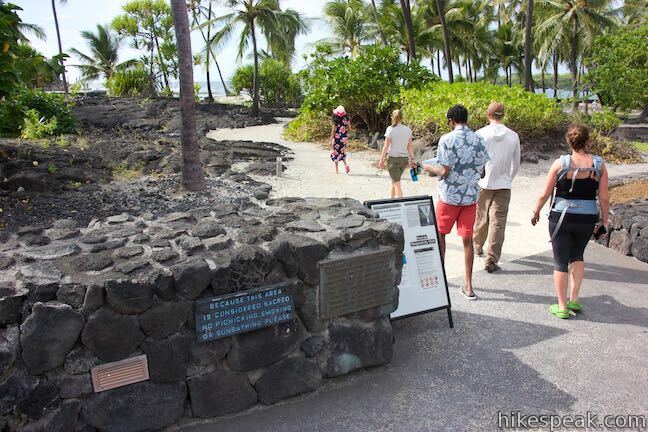 The visitor center is open daily from 8:30 a.m. to 4:30 p.m.
To get to the trailhead: From Kona, travel south on Hawaii Belt Road (Hawaii 11) for 8.5 miles. At an intersection with Mamalahoa Highway (Route 180) stay to the right and continue on Hawaii Belt Road, following signs for Volcano. 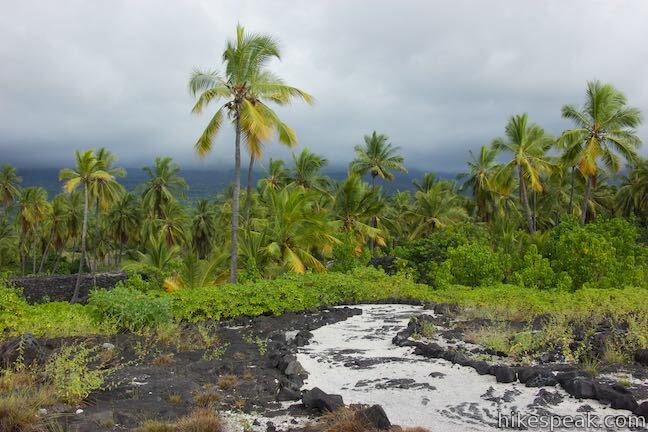 Drive 3.5 miles to Captain Cook and turn left to stay on Hawaii Belt Road at an intersection with Mamalahoa Bypass Road. 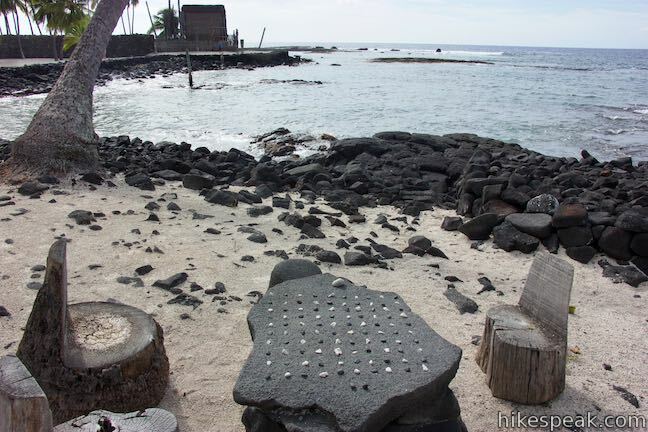 Drive another 6.5 miles south on Hawaii Belt Road to an intersection with Ke Ala O Keawe Road (Route 160) and turn right, following signs for Pu‘uhonua O Hōnaunau. 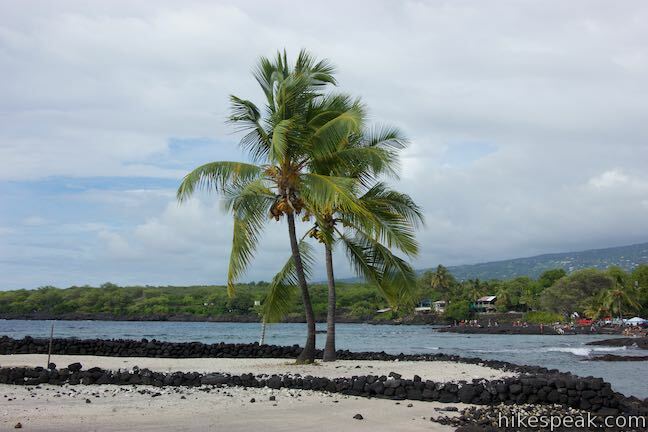 Traveling in the opposite direction as Kona, the intersection with Ke Ala O Keawe Road is 76 miles up Hawaii Belt Road from the town of Volcano and Hawai‘i Volcanoes National Park. 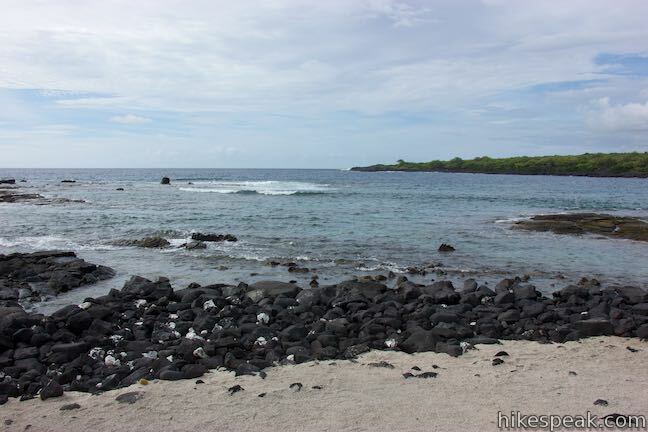 Drive 3.5 miles down Ke Ala O Keawe Road to the coast and turn left at a large sign for Pu‘uhonua O Hōnaunau National Historical Park. The entrance both is a short distance down the road, followed by the parking area and visitor center.